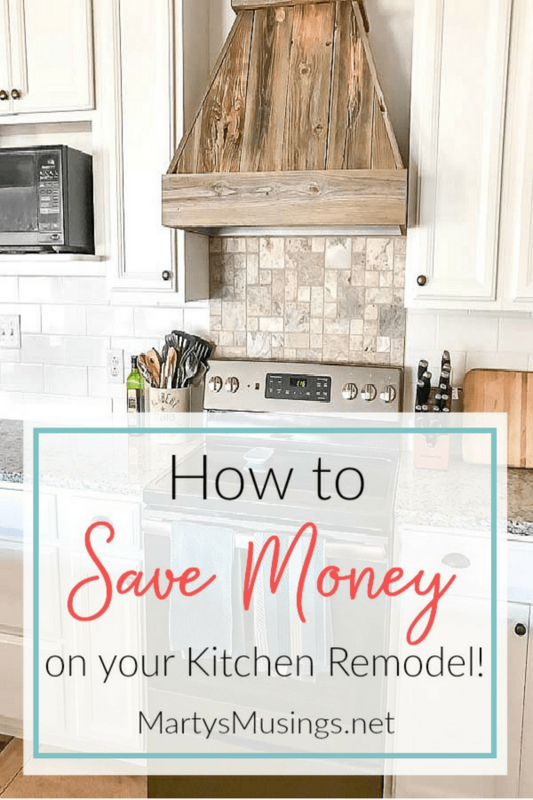 These practical tips and advice on how to save money on a kitchen remodel will save you both time AND money as you prepare for this big project! We all want to save money, right? I’m the queen of pinching pennies, but you already know that don’t you? Remember the time I used an old step ladder for a side table with shelves? Or when my DIY hubby took a closet door and made a headboard out of it? I love a good bargain. Free is even better! So you have to know our kitchen remodel is stretching my frugal ways to the max! Here’s a dose of reality, though. There was no way to take down a wall between our living room and kitchen, totally gut the room, fix the rotted floor and jack up the house, make the space resale worthy and keep it on the cheap side. Trust me. We wrestled every which way before making the decision to go all out (you can read all about it here.) After that we both dove into this project head first. 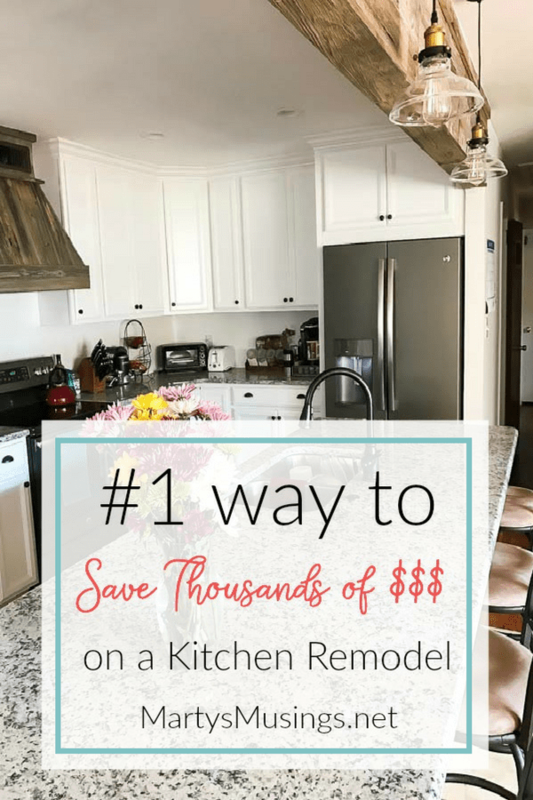 Are you ready for my number one tip on how to save money on a kitchen remodel? We had no idea what we were doing when this remodel began. 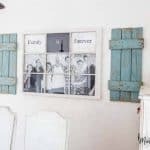 We’ve done tons of DIY projects (see my entire gallery here), including gutting a small bathroom, designing our front deck and making over our master bedroom, but this was the mother of all DIY projects! We didn’t know what we didn’t know. 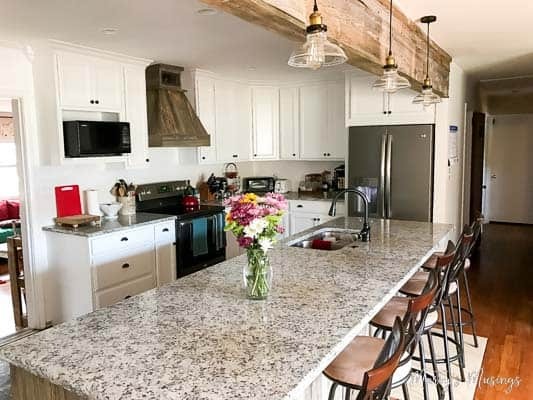 Today I want to walk you through our process in hopes it will show you how to save money on a kitchen remodel or any other large scale home improvement project. First we had to ask ourselves a few questions. Why were we doing this, what did we want and how were we going to pay for it? Why were we doing this? Our family is changing. We are soon to be empty nesters, yet we have added spouses and a grandson. When we all get together I didn’t want to be stuck in the kitchen while my family visited. I envisioned a new, modern kitchen and family room space where we could all be together. Our ranch style home just wasn’t designed for that purpose. How were we going to pay for it? 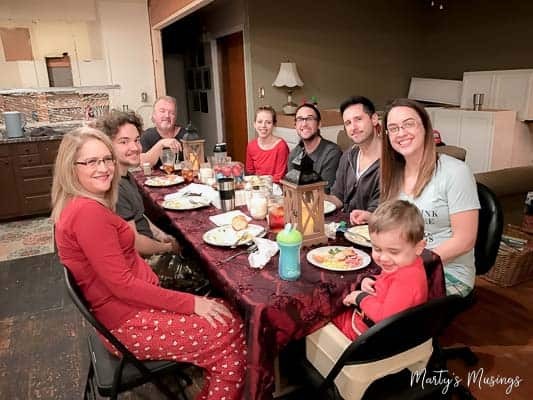 After living in our home for 25 years we were now one year from being mortgage free but we still lived in a home so badly in need of fixing it was beyond our ability to save for in real time. We also had a home equity line we used to pay off huge medical bills and the loss of income from Tim’s two rotator cuff surgeries and health scare last year. Our solution? We ended up rolling the last little bit of our mortgage, the equity line and what we borrowed for home improvements into a new 10 year mortgage which leaves us debt free by the time we’re 65 if not before. And we now have an amazing kitchen and family space that allows all of us to spend time together as our family gets bigger in the future. As we answered these questions the design conversations took over our lives for the next several months. What would you think if we……? If we do this then we need to……. I don’t think we can afford to……. We certainly didn’t need any conversation starters for date night for a while at least! 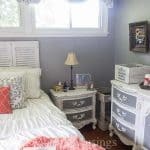 As we started researching, Tim took on the more technical side of things and I started analyzing my Pinterest boards for styles and space planning. We had to start somewhere so we asked questions of other people AND of ourselves. Since my blogger friend Suzy from Worthing Court had recently remodeled her kitchen I picked her brain a lot. Annoyingly so. I asked her to come to my house and I even went to her house just to look at her sink. Seriously. Should you use a contractor or not? What things can you do yourself? Don’t know any contractors/electricians/plumbers? Ask your friends, coworkers, church members. I asked for a referral from a real estate agent friend but there’s always my favorite place, Facebook (follow me here!) People love to give their opinions and are passionate about sharing contacts for those who have done good work. What things can you do yourself? Tim did all of the deconstruction of sheetrock and cabinets as well as replacing the sheetrock once all the new work was completed. He’s also doing the backsplash, flooring, painting and a few repurposed wood projects that you’re gonna love! He was able to work with our contractors and save us a lot of money because we asked questions before we hired them. 3. There’s no such thing as a dumb question. When we got in deep into the specifics of the kitchen as to cabinets and countertops, I decided I was not too shy to use my yard sale negotiating skills. Along with the regular sale deals we got at Lowe’s, I also got us a couple of specialty drawers free just because I asked! We saved about $6k from the original quote for cabinets by JUST ASKING QUESTIONS and making wise choices. We also saved $2/sq. ft. on the granite because I inquired if there were any other discounts available since we were basically getting the entire kitchen at Lowe’s. We purchased all new appliances at black Friday sale prices and Lowe’s said they would also match any other ads for lower prices. The store ended up with the lowest price but we saved several hundred dollars because of the time of year we bought the appliances. On a side note: the appliances were NOT in the original budget and were a splurge. Totally worth it though. I’m in love with my French door refrigerator. We also opened a Lowe’s credit card to save an extra 5% on purchases over $350. Although I don’t recommend this if you have bad credit or can’t pay it off, we were able to save even more and we paid it off immediately. 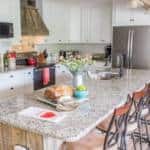 To sum it all up, if you want to save money on a kitchen remodel take time to ask yourself and all others involved questions as well as research each step along the way to save you money and time avoiding possible financial disasters and poor design choices and mistakes. Was this a helpful post for you? I’d love if you’d share it on Facebook or pin it so others can learn how to save money, too! Thanks so much, Suzy! We are absolutely loving the open space and I appreciate your input so much. You just come on over any time and I’ll be glad to feed you and Pookie! Still waiting on floors and paint but we’re getting closer! I’m doing the same thing as we speak. My wife and I are remodeling our HOUSE, lol. 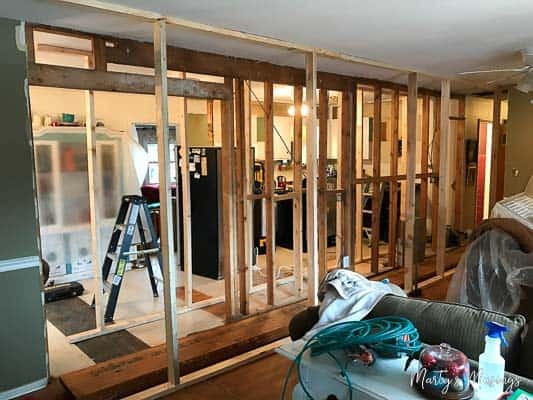 Removing load bearing walls, replacing bad floor joist and all, and living through it. We fill ya’lls pain lol. Love to see more post of these things your doing..
Hi, Stan. Good luck with your whole house remodel! It’s totally worth it but it can be a marathon, not a sprint! 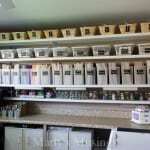 All of our kitchen remodel posts are listed at the bottom of each one. We’ve actually started on a total bathroom remodel right now so look for those in the future as well! Really love your passion & excitement. Plus, your level of commitment to detail & saving money is great. 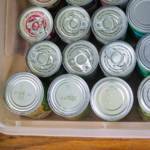 This article is a must-read for anyone really looking to save money. This, to us, is very top-of-mind these days when we see people talking about upgrading their kitchens. Really appreciate the thought & time you put into this. It’s great insight for us to get into your mind as well to better understand how to serve our clients. Thank you Marty for a great & interesting read!!! Hi, Paul. Thanks for commenting. 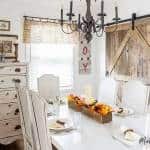 We had wonderful contractors who helped us immensely but they also allowed us to DIY as much of the kitchen as we could which was probably an unusual arrangement. Most homeowners probably don’t spend as much time researching as we did but that would make your job easier if they did, wouldn’t it? Have a great day! From my point of view, you have to first prepare your wish list before jumping into the kitchen remodel. If your kitchen needs little improvement, you can opt for DIY. You can repair the walls, roof and floor of the room. An attractive paint is also a good idea. You can fix the light issues and bring in new LEDs for worthy decoration. 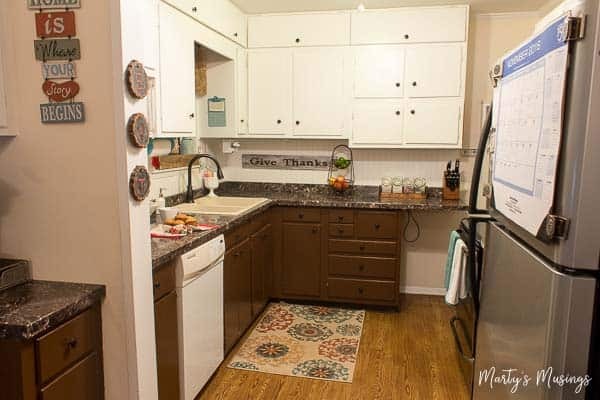 You can also bring in new appliances and furniture to the kitchen. You should keep out the unused items. You should take care of proper management of space. I like that you mention asking people you know to find a contractor. By asking people you know and trust, you’re more likely to hire a reputable contractor to help with the job. 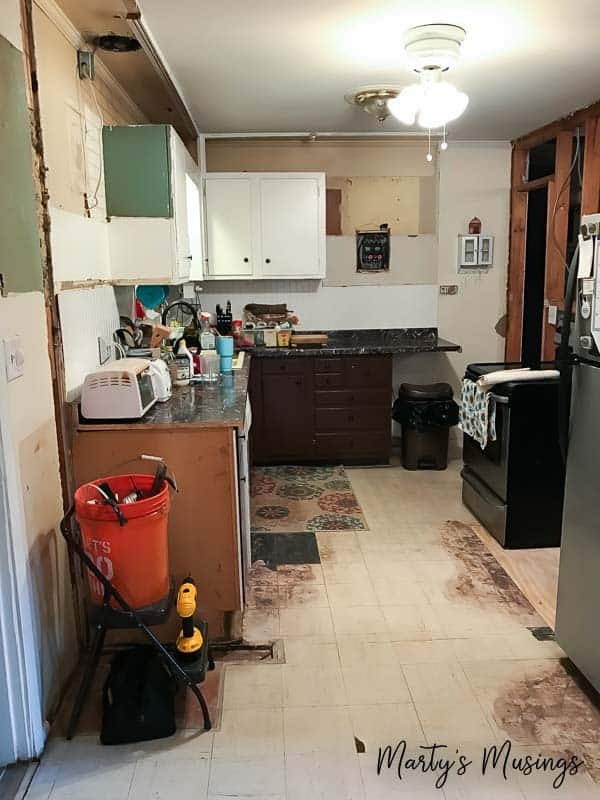 my husband and I are looking to remodel our kitchen and we know it’s going to be a long process, so we’re looking for a contractor right now. These were great tips for things to help us as we begin our project. Thanks! Hi, Cameron. I’m sorry I didn’t see this comment until now. You’re so smart to shop for a contractor ahead of time. I would also say ask on facebook because people love to give their opinions and experiences and often they are spot on! I got a reference for someone and the company happened to be someone we knew that went to one of our church campuses! Good luck on your remodel! 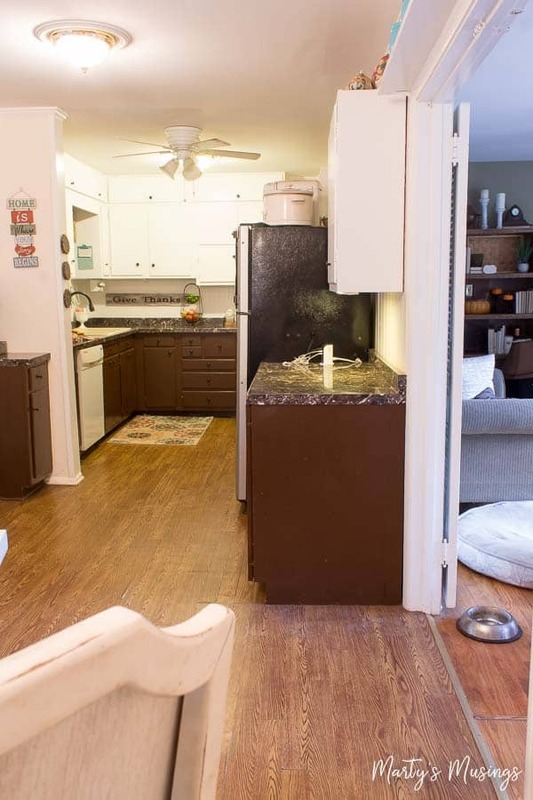 I am trying to remodel my kitchen, it is a very awkward layout. My sons tell me move the frig down on the same wall but I want to move it altogether and make my triangle workspace. Any suggestions? My husband and I live in an older home, and it really looks its age. We want to remodel it so that it has a more modern look and more space. So I like how you point out that you should ask other people you know for contractors and electricians and things like that. We’ll have to do that to find a remodeling contractor who’d be able to help us. My fiance and i want to look into getting some remodeling done in our new home. We really like that there are so many posts that are dedicated to giving good advice like this one. I like what you said about no question being a dumb question. I have been thinking about doing a kitchen remodel this upcoming year. It is good to know that it would be smart for me to considering replacing my cabinets. That does seem smart because my cabinets are pretty old. It would make a pretty big difference getting new ones.